When you go online shopping in Australia to buy a skateboard or caster board, you'd better ollie on over here to CrazySales! 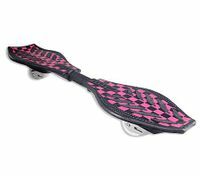 We've got snakeboards and Ripstiks at the lowest prices in Australia! Skateboarding is a sport that never loses its cool, and a skateboard makes a great gift for boys or girls. Our skateboard and Razor Ripstik prices will save you anywhere from 30% to 80% off the standard retail price. You're not going to get a lower price on caster boards than our crazy deals! Our range of caster boards features leading brand board like the Razor Ripstik, and we've got special deals on rocking, snake-motion boards that even feature sparking LED wheels! Whether you're buying your kids presents or are looking for a new way to get fit on the way to work, CrazySales selection of caster boards, skateboards, snakeboards and Ripstiks has something for you at the best price on the web! Make sure not to miss our frequent clearances on caster boards, skateboards and Ripstiks! We get our products directly at the factory door to get the deals direct to all of our customers. If you order Ripstiks, skateboards and caster boards at CrazySales, you'll pay the lowest price on the finest products. We use quick, cheap shipping to get you your purchase. If you're not totally satisfied with your skateboard, caster board, snakeboard or Ripstik, then just send it back to us within 30 days for a full refund. Join more than 500,000 happy shoppers at Australia's fastest growing online shopping site, CrazySales. We use secure online shopping technology so that your caster board, skateboard or Ripstik purchase is completely safe. Our CrazyPoints shopping reward system, the more you buy, the more you save!